The ECB's Balance Sheet At A Glance. The Russian ruble strengthened the most in more than three months against the dollar this morning (gaining 1.7 percent to 32.2247 per dollar at one point) as oil rebounded above $60 a barrel and OAO Sberbank reported better-than-expected earnings. Sberbank shares jumped 5.1 percent after first-quarter net income turned out to be above analyst estimates. But the rise was also helped by the fact that Russia’s central bank spent approximately $2 billion from reserves to try to stop the ruble from falling yesterday, taking central bank reserve spending over the two working days since they lowered interest rates half a percantage point on Friday to around $4 billion, according to reports in the newspaper Kommersant. Russia’s central bank cut its main interest rates for the fourth time in less than three months at the end of last week after the government estimated the economy contracted an annual 10.2 percent in the January-May period. 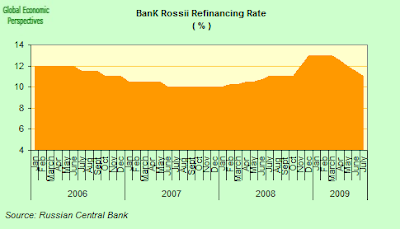 Bank Rossii lowered the refinancing rate to 11 percent from 11.5 percent following on initial reduction on April 24 and two further cuts on May 13 and June 5. But the striking thing here is that today's ruble surge followed seven consecutive days when it fell - including yesterday when it dropped 0.5 percent against the euro and 0.1 percent against the dollar to hit the lowest close against the central bank's currency basket since May 4. Indeed only last week the ruble posted its steepest slide against the euro and dollar since January as oil prices fell and Russia's budget deficit contined towiden. And to top it all, as I say, the central bank reduced interest rates for the fourth time in less than three months. Indeed just after the rate cut Alfa Bank’s Chief Economist Natalia Orlova commented that she was seeing a “very fragile trend” in the ruble, with a lot of downside potential: and I completely agree with her. What we have is a lot of volatility and a lot of market nervousness. Just this morning Bloomberg cited a research report from the ING Group warning that "the ruble may drop as much as 5.8 percent to the weakest end of Russia’s target exchange-rate basket as the central bank aims to revive credit by lowering key interest rates by up to 4 percentage points.” (research note here). My feeling is that a 400 basis-point reduction would have an even bigger impact than even ING expect. Basically central banks in a number of central and east European countries are caught in a kind of trap, where the high level of forex borrowing both households and companies have engaged in makes local monetary policy rather impotent, and worse, this impotence itself becomes a self perpetuating situation. The trap perpetuates itself since people become reluctant to take out local currency denominated loans due to the high interest rate they carry, so they take out either dollar- or euro-denominated ones and thus make matters even worse, making the possibly erroneous assumtion that end game of all this will be either a dollar collapse (the Russian view) or eventual euro membership (in places like Hungary and Romania). Those doing the borrowing thus feel themselves to be completely covered, and fail to take into account the capital loss that could follow a large correction in their own local currency. Slowly monetary policy makers in the most affected countries are coming to recognise that they need to address the issue, and somehow or other to get rates down, since the problem is not going to simply go away, and the meanwhile the respective economies keep on shrinking, with no positive boost from local monetary policy. But it is just when they start to lower rates that things start to turn nasty on them, since the whole situation is non-linear. Supporting a currency with high interest rates works for as long as it does on the win-win dynamic of yield differential AND a rising currency, but once the so called carry trade "punters" get the idea that political pressures to address the economic contraction may force substantial rate cuts on the government and the monetary authorities, and that the expectation of such rate cuts may lead the other "punters" to sell local instruments and exit the market, then the "thinking punter" finds he or she also needs to sell, and this is how we get to see that "will the last one out of the door please turn the lights off" type of self fulfilling herd behaviour. I would say Serbia, Ukraine, Hungary, Romania and Russia are all vulnerable to this kind of outcome. Of course, from a macro economic viewpoint they can all start to bring interest rates down as inflation steadily drops, but I'm not sure that the inflation element is an important consideration for the short term carry-trade people, since it is the absolute yield differential, and the currency dynamics that would seem to matter most. Evidently the background to all this nervousness is last week's announcement from the economy Ministry that Russia’s economy may shrink by as much as 8 to 8.5 percent this year. Gross domestic product probably contracted by an annual 10.2 percent in the first six months and may slump at a 6.8 percent annual rate in the second half, according to the latest Ministry forecast. Behind this drop in GDP lies the fact that Rusia's exports were down by 47.4 year on year in the January to May period, largely due to falling prices for oil and raw materials. The economy ministry also said it expected capital investment to fall by around 21 percent this year as utility and energy companies, which account for about a third of total investment, cut spending programs. The ministry forecast is based on an oil prices scenario of an average $54 a barrel in 2009. Further, industrial production is expected to shrink between 11 percent and 13 percent as manufacturing falls by as much as 17 percent. Inflation of between 12 percent and 12.5 percent is forecast, down from last year’s 13.3 percent. And retail sales are expected to suffer an annual contraction of 5.8 percent. For the 2010 to 2012 period the ministry currently predicts a 1 percent expansion next year, followed by a 2.6 percent one in 2011 and 3.8 percent one in 2012. This “moderately optimistic" scenario would produce a deficit of 6.5 percent in 2010, followed by further deficits of 4 percent and 3 percent over the following two years. 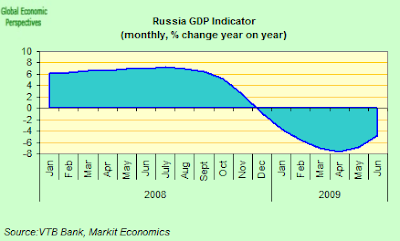 Government officials have recently stated they expect Russia to have a budget deficit of around 9% of GDP in 2009, up from an earlier 7.4% estimate. Industrial production shrank a record annual pace of 17.1 percent in May, while capital investment fell the most since December 1998, dropping an annual 23.1 percent. 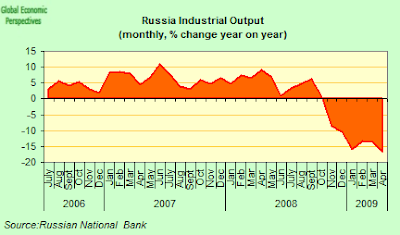 Russian unemployment fell back for the first time in 10 months in May, but despite the positive effect this may produce on confidence the rate is sure to rise further in the months to come. Retail sales fell the most in almost a decade in May, sliding an annual 5.6 percent, the fourth consecutive decline and the biggest since September 1999. The average monthly wage decreased an annual 3.3 percent in May, while real disposable incomes dropped 1.3 percent. After all the inflation which seems to have become endemic in Russia, deflation would seem to be the most unlikely of scenarios, and indeed it is not the most likely of out comes, given the capacity of the authorities to allow the value of the ruble to fall. 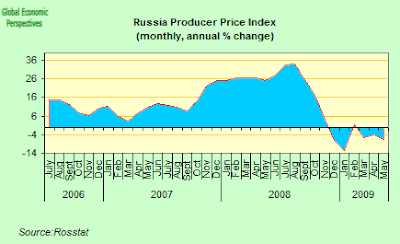 However, downward pressure on producer prices is evident at this point, and the cost of goods leaving Russian factories and mines dropped an annual 6.5 percent in May after falling 4.1 percent in April, according to the Federal Statistics Service. Prices rose 0.6 percent from April. 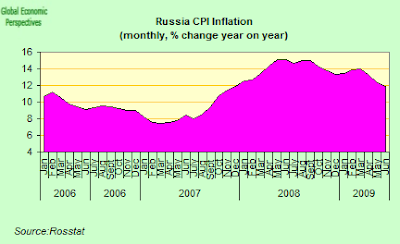 Russia’s inflation rate - which fell to an 18-month low in June - is still far too high. The rate dropped to 11.9 percent from 12.3 percent in May. Consumer prices rose 0.6 percent in the month, the same rise as registered in May. Russia’s inflation rate has averaged more than 14 percent a year since the country’s 1998 default and is certainly one of the biggest headaches facing the country. 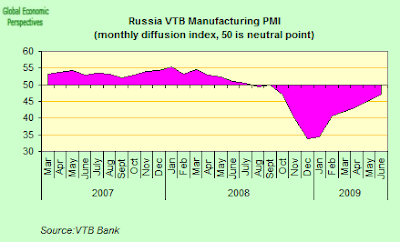 Russia’s manufacturing industry shrank last month at the slowest pace since September, and VTB’s Purchasing Managers’ Index advanced to 47.3 from 45.3 in May. So the rate of contraction is easing. 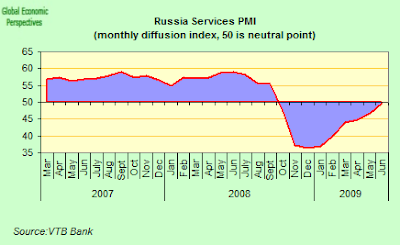 Further Russia's service industries shrank in June at the slowest pace since the contraction began in October, according to the VTB Capital Purchasing Managers’ Index which rose to 49.7 from 46.6 in May. As a result the VTB Capital GDP indicator showed an annual 6.4 percent rate of contraction in the second quarter following a 5.4 percent decline in the first three months of the year. But output was shown shrinking at a 4.8 percent rate in June (from a year earlier) as compared with 6.8 percent contraction rate in May. “The GDP indicator suggests that the economic decline in the second quarter of 2009 is likely to be similar to, or slightly worse, than in the first quarter,” Aleksandra Evtifyeva, an economist at VTB Capital, said in the report. “However, the prospects for the second half look brighter.” The pace of Russia's economic contraction eased to a 5-month high of 4.8 percent year-on-year in June, compared with a 6.8 percent shrinkage in the previous month, VTB bank's GDP indicator showed on Monday. The June reading "suggests that the economic decline in the second quarter is likely to be similar to or slightly worse than in the first one," VTB Capital senior economist Aleksandra Yevtifyeva said in the report. 2009 Contraction In Double Figures? According to the latest report from the World Bank collapsing industrial production, rising unemployment and ongoing capital flight will reduce Russia’s gross domestic product by 7.5 percent this year and restrain “intraregional trade flows and transfers,”. The Bank also highlighted that “Remittances to the broader CIS region are expected to decline for the first time in a decade, by 25 percent”. 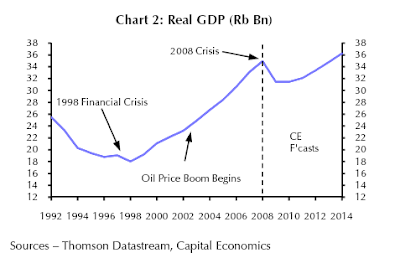 Neil Shearing of Capital Economics forecasts a contraction of 10% this year, zero growth in 2010 and fears that Russia may be facing a kind of "lost decade", since it may well not recover the 2008 level of output till 2014, and there are still clear downside risks attaced even to this estimate. Shearing identifies three main factors which may contribute to the lost decade. First and foremost, he notes, the banking sector remains under enormous strain. While official estimates put bad debt at around 12% of total loans this year, Shearing thinks the true figure is likely to hit something closer to 20%. On this basis, he estimates that the banking sector could require up to $60bn in additional capital – far more than the $30bn that has so far been allocated by the government. Second, by using so much ammunition this year, authorities leave little scope for further policy stimulus. Monetary policy is somewhat hamstrung as we have seen earlier, and fiscal policy will have to be tightened over the coming years in order to rein in a ballooning budget deficit. Indeed, Laura Solanko of the Finnish Central Bank's Transition Economies Centre calls this "the largest fiscal stimulus ever" in the Russian context. As Solanko points out, the current crisis has hit oil and gas exports particularly hard, leading to a 47% decline in export duties and a 53% decline in proceeds from taxes on natural resource extraction during the first four months of 2009. The drop in general economic activity has further reduced proceeds from all revenue sources. General government revenues in January–April were 20% lower than a year earlier. If current trends continue, Solanko estimates that general government revenues may drop to close to 35% of GDP this year - down from around 50% in 2008. Meanwhile, government expenditure has increased dramatically at all levels. In January–April this year, enlarged government expenditure increased by 23% to RUB 4,140 billion. The expenditure at the core of the Russian fiscal system, the federal budget, increased by an astonishing 37% compared with the same period a year earlier. Even taking the fairly high inflation into account, this equals a 20% increase in federal expenditure in real terms. Relative to GDP, general government expenditure has risen to 37% and federal expenditure to 23% of GDP, against 28% and 16%, respectively, a year earlier. To sum up, public sector expenditure has nominally increased by 23%, and relative to GDP by a whopping 9 percentage points compared with the first four months of 2008. The sheer magnitude of such a fiscal stimulus is huge. During the 1990s, Russia’s public sector shrank dramatically, its GDP share decreasing by 12 percen-tage points to 26% of GDP in 1999. The current fiscal stimulus has shot public expenditure back to the level of the early 1990s. As the automatic stabilisers in the Russian fiscal system are small, the expenditure increase largely reflects expenditure on anti-crisis measures and advance transfers to the regions by the federal government. The government’s anti-crisis measures announced by mid-March 2008 alone would increase federal expenditure by some RUB 2,000 billion, or 15%, in 2009. Roughly half of that is directed to strengthening the financial system, and the other half to supporting the real sector. The current federal budget foresees a deficit of 7% of GDP, a figure only slightly larger than last year’s surplus – and only slightly smaller than the total assets of the Reserve Fund. 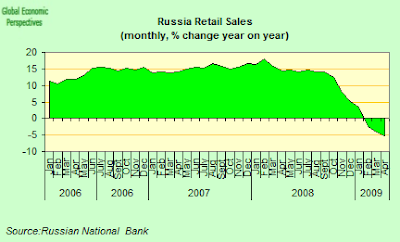 This im-plies that most of the Reserve Fund will be exhausted by year end and the Russian government will have to reenter the domestic and external bond markets in 2010 at the latest. "Oil price dynamics pose additional risks to RUB. Last week, oil prices plunged below the technically important EMA-200 level of US$63/bbl, indicating a potential further drop to US$47-54/bbl. If this happens, the RUB looks destined to weaken as well, given its greatly strengthened correlation with oil prices over the past two quarters". And if oil does drop back to this range, and the ruble does weaken, and non performing loans rise above the 20% mark (pushed by that very same ruble weakening, and the rising unemployment), and the Russian Federal Government has to start issuing bonds in 2010, well watch out, is all I can say, since trouble will surely be in store. This is very much knife edge touch and go stuff from here on in. Grit your teeth everyone. 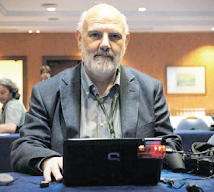 Edward 'the bonobo' is a Catalan macroeconomist and economic demographer of British extraction, now based in Barcelona. By inclination he is a macro economist, but his obsession with trying to understand the economic impact of demographic changes has often taken him far from home, off and away from the more tranquil and placid pastures of the dismal science, into the bracken and thicket of demography, anthropology, biology, sociology and systems theory. All of which has lead him to ask himself whether Thomas Wolfe was not in fact right when he asserted that the fact of the matter is "you can never go home again". He is currently working on a book with the provisional working title "Population, the Ultimate Non-renewable Resource". Apart from his participation in A Fistful of Euros, Edward also writes regularly for the demography blog Demography Matters. He also contributes to the Indian Economy blog .